I’ve been reading a Swedish novel over the last two weeks and found something quite interesting. 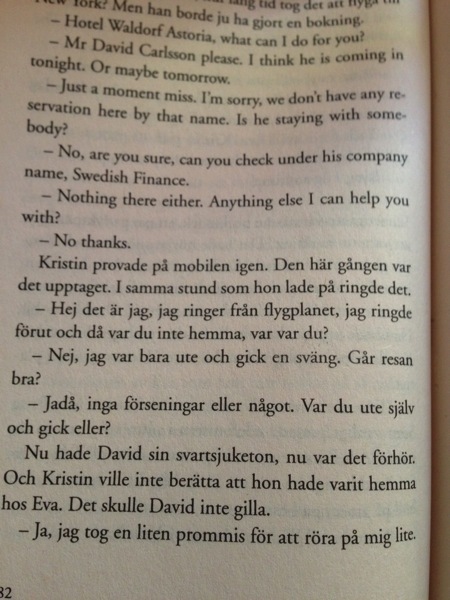 At one point in the book the protagonist calls up the hotel her husband is supposedly staying in in New York – but the interesting thing for me was that the novel simply switched to English when she made the call rather than continuing on in Swedish. According to the 2012 Eurobarometer report on Europeans and their languages, 86% of Swedes (and Danes) say that they speak English well enough to have a conversation. Only the Dutch at 90% and the Maltese at 89% have a higher rate of English language ability in Europe. For me, the assumption is clearly that Swedes will all understand English well enough for this language swap to be completely acceptable. I’ve occasionally seen the odd French phrase included in English language novels, particularly when reading the classics, but never entire paragraphs, and certainly never in chick lit novels such as the one I found this example in (Väninnan by Denise Rudberg). Have you seen other novels with entire paragraphs in another language? I’m really curious to see whether this is a common theme around the world, or if it is simply because the Swedes are so confident in their English language abilities. I wonder if it is also the case in Dutch books too. Reading in Swedish, how impressive!